Spring has sprung and our lambs have arrived! Come and see the Spring lambs for the first time at Uncle Henry’s this year. Visit the lambs throughout the Easter holidays. All our sheep will be in the large grass field to your left as you come down the drive see if you can spot them on your way. 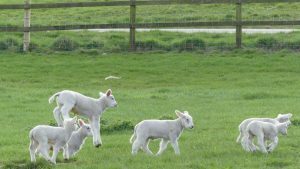 Pedestrian access to the small adjoining grass paddock is available so you can get up close and enjoy the lambs bouncing around the field. Our woolly white lambs are Easycare Beltex crossed twins with long fluffy tails.